Living Area 2175 Sq. 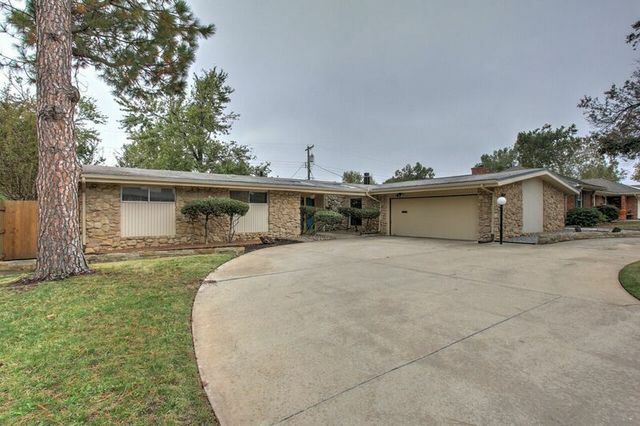 ft.
UNBELIEVABLE MID CENTURY MODERN HOME in Windsor Hills! If you are looking for a house that is truly modern, look no further. The architecture of this home is stunning from the stone working outside to the stone wall inside, the windows, fireplace, and the lighting is quit spectacular! The spacious living room has amazing windows with views of the backyard it is open to the dining room and bar area. The dining room is also open to an additional living room that boasts the incredible original fireplace. Did you see the original stone wall separating the living room and kitchen?? It will literally make you want to buy this house. The master suite includes a full bathroom with shower and walk-in closet. The backyard is an oasis all in itself. From the covered patio area to the landscaping with mature trees. There is also additional storage building in the backyard. Come make this modern gem your new home!